When in Rome, do as the Romans do. And when in Orlando, do as Disney World would do. 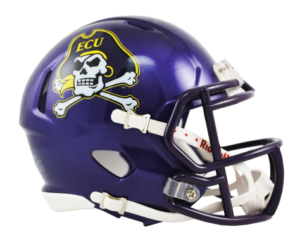 The defining part of any team’s uniform is its helmet. Some are so iconic and magnificent that they are symbols of their university and recognized around the world. 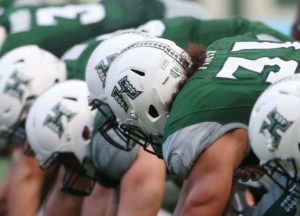 With that in mind, we rank college football’s Top 25 helmets out of all 130 FBS teams. 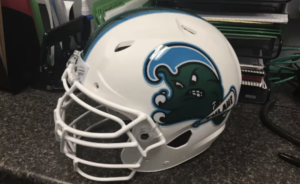 We’ll never stop calling for the throwback rainbow helmets but we have to admit the current lid is still pretty cool. 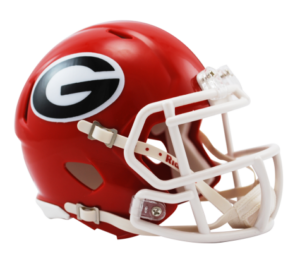 The Bulldogs don’t get many points for originality but at least they copied one of the NFL’s best helmets. And bonus points for the dog bone helmet stickers. The purple really makes the block “W” pop. 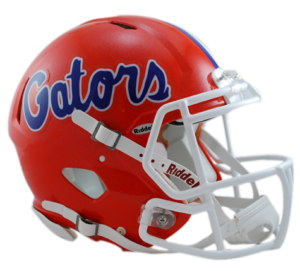 Your nickname in script isn’t the most original helmet but it just looks so good on the Gators. 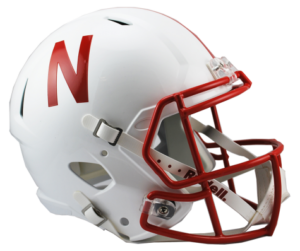 The Cornhuskers’ block “N” helmet is so understated, just the way the people of Nebraska like it. Every time we see it, memories of Tommie Frazier, Scott Frost and Eric Crouch come rushing back to us. 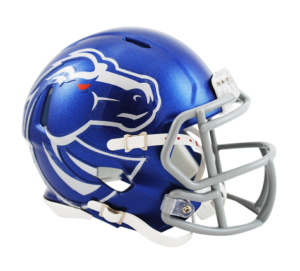 We love the design of Boise State’s helmet logo, along with the fact that it’s super-sized. That evil orange glare adds some intimidation as well. 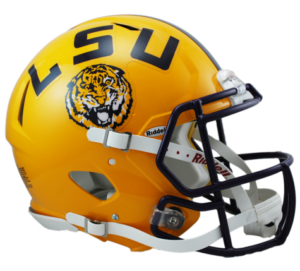 Everything about LSU’s helmet is just so old school and SEC. 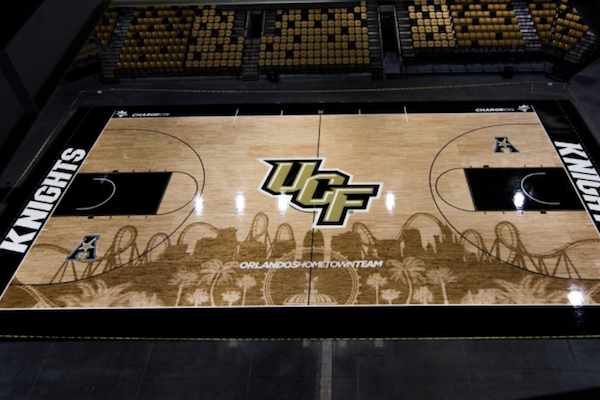 When we see it, we just want to run through a brick wall. 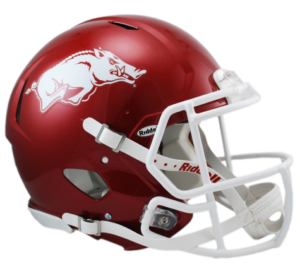 What is it about that running hog that makes such an ugly animal such a beautiful helmet logo? 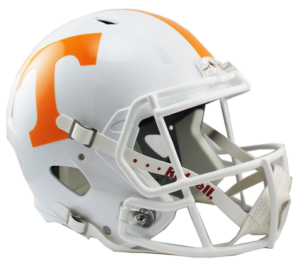 Love or hate Tennessee’s unique shade of orange, the Volunteers’ block “T” is unmistakable and undeniably striking. 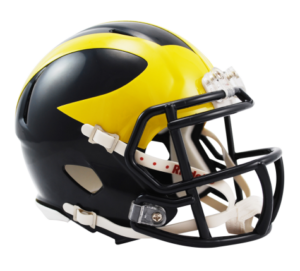 Beauty truly is in the eye of the beholder as some people look at Penn State’s helmet and see nothing more than a blank lid with a blue stripe down the middle. But its place in college football history cannot be denied. 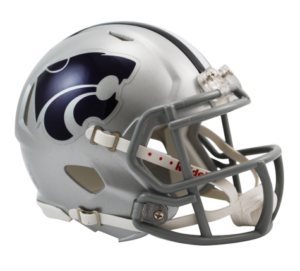 The “Powercat” logo is not only marvelous, it’s light-years ahead of K-State’s previous helmet — “Cats” in script. 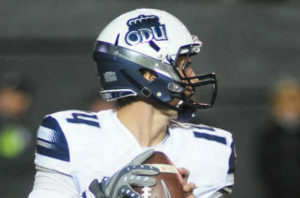 A lot of people still don’t know Old Dominion has an FBS program. Well it does, and the Monarchs have the most regal helmets in the game. 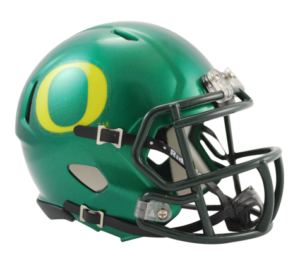 The Ducks’ base helmet with its matte green background and idiosyncratic block “O” is so sharp. We just wish they wore it more than once a year. 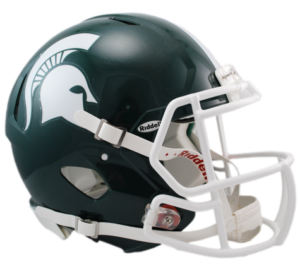 While the Spartans are always overshadowed by the Wolverines — even in helmets — MSU has arguably the best logo in college sports and an awesome helmet to boot. 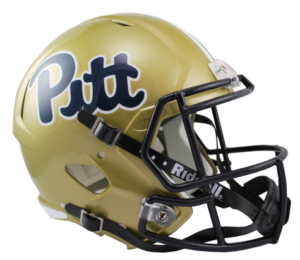 After the “Dinocat” disaster and the ugly block letters, we finally have the beautiful script “Pitt” back in our lives. 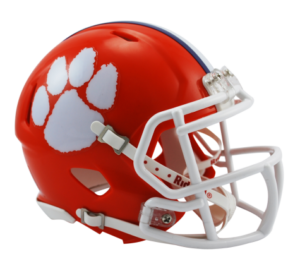 We could do without the mini-paw helmet stickers but the orange lid and giant white paw print is about as crisp and clean as it gets. Ask a Hawkeyes fan about their legendary “Tigerhawk” logo and get ready for a long list of reasons why it’s the greatest logo in sports. 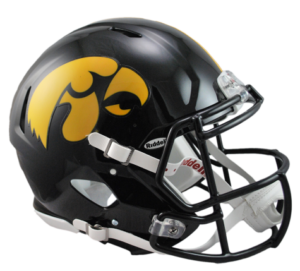 While we won’t go that far, it makes for a splendid helmet in Iowa’s black and gold. After years of futility, Colorado’s football program is finally relevant again. 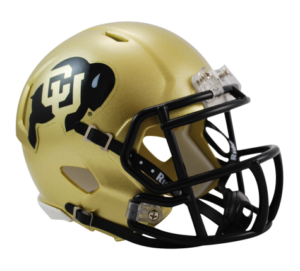 One thing that never changed: Its spectacular buffalo-adorned helmet. 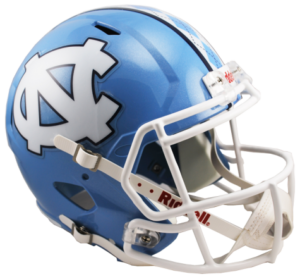 The Tar Heels very sneakily have one of the best helmets in the FBS with that gorgeous Carolina blue on the side and clever argyle stripe down the middle. 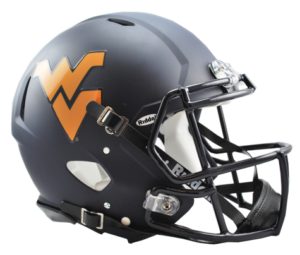 Of all Don Nehlen’s fabulous accomplishments in Morgantown, none may be bigger than introducing the “flying WV” logo in 1980. 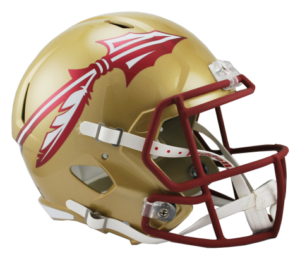 As if the spear isn’t great enough on its own, the mini-tomahawk helmet stickers take this helmet to the next level of beauty. 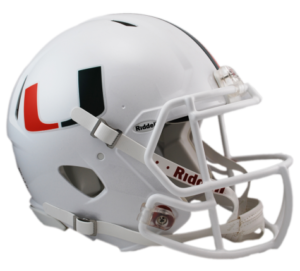 The Hurricanes have constantly tinkered with their uniforms over the years but the trademark helmet with the “U” in green and orange has thankfully remained unchanged. 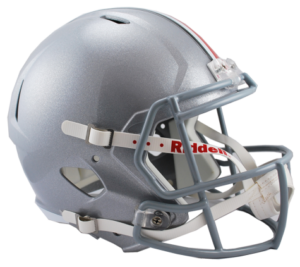 What makes this helmet special is the Buckeye leafs that act as a de facto logo. There’s nothing more beautiful than a star player’s helmet full of leafs on both sides. Shiver me timbers! We bet you didn’t see this one coming. It may not be as great or iconic as the Oakland Raiders’ helmet, but you can never go wrong with a skull & crossbones logo. 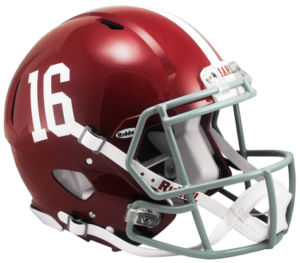 Yes, we know Alabama’s helmet is just player numbers on both sides of the lid. The simplicity of it is so beautiful, as is that unmistakable shade of red. 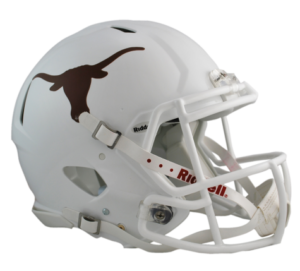 The Longhorns’ helmet is so minimalistic and yet so perfect, with the silhouette of a Longhorns’ head very striking in UT’s classic Burnt Orange hue. 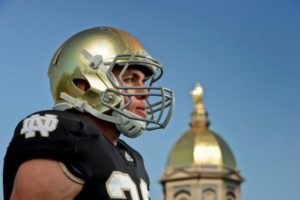 Notre Dame has a helmet befitting its status as the most iconic program in America. 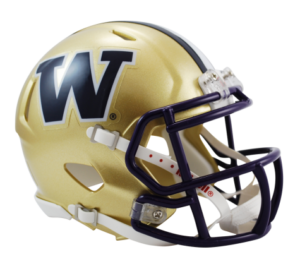 The glittery effect the Irish added in 2011 really makes the helmet pop on another level. 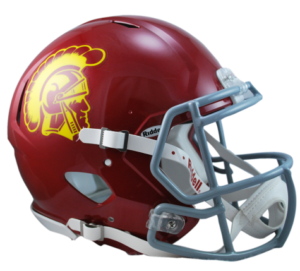 The logo is so simple but bold and the cardinal and gold mesh exquisitely to give the Trojans’ lids a classic Old Hollywood feel. 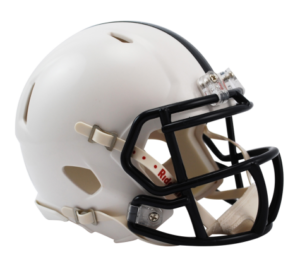 It just doesn’t get any better than the “Winged Helmet” designed to help quarterbacks see receivers down field. The matte finish on the lid introduced before the 2016 season makes it a just little more badass. Not only did LSU lose to a Sun Belt team, 24-21, and give Troy nearly $1 million in the process for playing in Baton Rouge — the Tigers then got roasted by the Trojans for losing at homecoming. The Louisville basketball program is on the verge of imploding with allegations that UL funneled $100,000 to star recruit Brian Bowen via Adidas. As a result, athletic director Tom Jurich and head coach Rick Pitino are on the verge of being fired, and the negative repercussions from the NCAA and FBI could be crushing. Nothing sums up the scandal better than this viral Photoshopped t-shirt showing the FBI playing Louisville in a bracket-style tournament, and the Federal Bureau of Investigation advancing. Mascots are supposed to entertain little kids, not run them over like a Mack truck. Baker Mayfield talked at length about how disrespected he felt last year when Ohio State sang “Carmen Ohio” on Oklahoma’s field after the Buckeyes beat the Sooners. Well, on Saturday night after OU’s 31-16 win in Columbus, Mayfield got his revenge — and then some — by planting the Sooners’ flag at midfield of Ohio Stadium. Cameron Baker is a Class of 2019 recruit out of Council Bluffs, IA, who looked like more like “Tecmo” Bo Jackson on this run last Friday night. Baker finished the game with 15 carries, 336 yards, 5 touchdowns and countless recruiters drooling all over themselves. Mike Gundy, eat your heart out. According to the Knoxville News-Sentinel, the Sevier County player who delivered the powerbomb was ejected and the Gibbs H.S. player on the receiving end was OK.
Let’s leave moves like this to wrestling professionals. While the Volunteers were falling behind 24-0 to Georgia in the first half, Tennessee fans turned on each other in the stands during this nasty brawl.